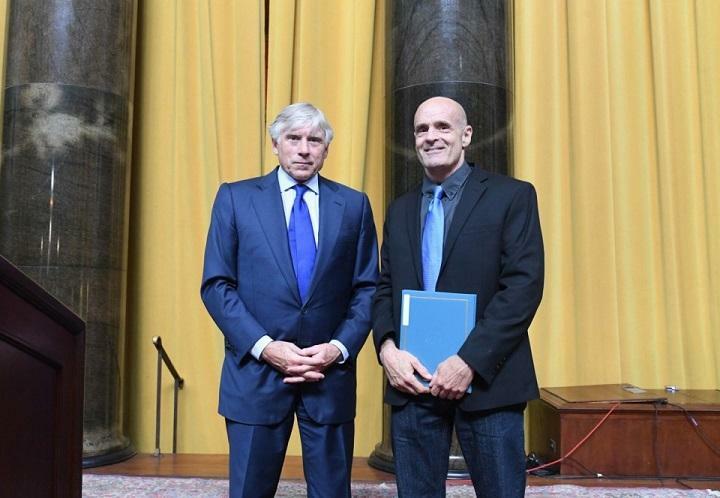 Jack Davis (right) accepts his Pulitzer Prize from Columbia University President Lee Bollinger. Gov. Ron DeSantis said this week he'd be "raising Cain" if national plans for oil drilling include Florida waters, particularly in the Gulf of Mexico. The story broke just as Jack Davis, a professor of environmental history at the University of Florida, came to Tallahassee to discuss his book on the world's tenth-largest body of water. Davis won the 2018 Pulitzer Prize for History for "The Gulf: The Making of an American Sea." On Sunday, he spoke at the Word of South literary and music festival in Tallahassee, where he was introduced by distinguished environmental writer Diane Roberts. "This state is a vexed and magical place all at once," Roberts said. "It's complex, how we got to that place. The how-we-got-there has so much to do with our being wet, basically. We're half water." Davis writes about both the magic and the vexation. He grew up on the Gulf of Mexico, which his book traces from its formation to present time. He says he wrote it for a general – not an academic – audience, because he wanted readers to understand how they're connected to the Gulf. "The Gulf of Mexico is one of the richest estuarine environments in the world," he said. "We have a commercial fishery. The U.S. Gulf Coast commercial fishery is more productive than the entire East Coast fishery - except when there's an oil spill, of course." Eighty percent of domestic shrimp come from the Gulf, he said, and 40 percent of domestic oysters. It's also the most popular saltwater fishing spot in the country, which has drawn many people – including the painter Winslow Homer. Davis read from his book about Homer's trip to the Gulf in 1904. "Wherever Homer drifted with bait and tackle, the water beneath his rowing skiff was clear several feet to the grassy bottom, flush with crabs, mullets and a thousand living things unseen. Among the most scintillating of sights were fish in schools as long as freight trains, running with the invisible Gulf tide. Their imposing numbers invited eagles and ospreys that circled overhead." Lyrical and scientific, the book ranges from tales of the Gulf's heroes to the loss of its shorelines and living creatures. Many parts are still as pristine as when Homer was here, Davis said, but by the late 1960s, the bays and bayous were on the verge of ecological collapse. "Every municipality on the Gulf was dumping raw sewage into the waters that were the basis of their tourist trade," he lamented. "But it wasn't just the Gulf-side municipalities. It was faraway places up those rivers in other parts of the United States. Whatever they put in the rivers, it ends up in the bay." Now people want to know whether there's hope for the Gulf. Davis says there is, crediting the Clean Water Act of 1972 and the efforts of universities, nonprofits, conservation groups and private landowners. "One of the big trends now, which is an extremely important one, is restoring the living shoreline - the sea grass beds, the oyster bars, mangrove forests where they can grow, and coastal marshes," he said. "They are the best defense against sea level rise and intense seas." Davis called restoration of the living shoreline a win-win-win, because they are also the nurseries for marine life and absorb carbon from the air and water. Davis is also the author of the award-winning "An Everglades Providence: Marjory Stoneman Douglas and the American Environmental Century." Florida’s offshore drilling concerns have made headlines recently. And now, nearly 80 years into the industry’s existence in Florida, state government officials are searching for some permanency on the issue. New research shows pollution in the Gulf of Mexico is coming from a source close to home: our closets. A team of scientists say plastic microfibers in polyester, nylon and acrylics are washing out of household fabrics and into the ocean. April marks six months after Hurricane Michael wreaked havoc in the Florida panhandle and half a year later, Panama City and Mexico Beach are still in shambles. On the six-month anniversary of the storm, more than 70 organizations came together to host a "Pray for Bay" event meant to unify the community and provide outreach.